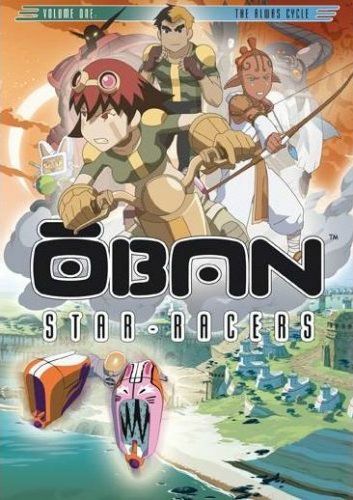 I dove into the four-disc DVD set of this French/Japanese animated series known as Oban Star-Racers having absolutely no idea what to expect. Would it be an awesome series of animated perfection like Avatar: The Last Airbender, or would it turn out to be just another bland TV show made for children that lacks real drama and fails to establish a real emotional connection? Thankfully, Oban Star-Racers turned out to be the former, an excellent series that will easily hook both kids and adults into the arcing story and keep them entertained up until the final episode. The only disappointment here is that the series has to end. I seriously hope a second season will be considered. The story starts in the year 2082, where we meet a girl named Eva, who has just turned 15 years old. Living at a boarding school, Eva is desperately hoping for some kind of contact from her father, Don Wei, whether it be a birthday present or a simple phone call. But it has been years since she has seen her dad, and she's fed up with waiting, so Eva decides it's time for an early graduation and takes off on her hover bike. As Don Wei is the well-known owner of Wei Racing, she knows exactly where to find him, but when the two are finally standing face-to-face, he doesn't even seem to recognize her. Eva quickly makes the decision to provide him with a false name, taking the name "Molly" from a nearby poster. After she fixes one of his racers, he agrees to keep her on his team, though soon he learns that his team has been selected to represent Earth in an intergalactic race, and she is not invited along. But Molly is one tough cookie and refuses to lose her father again. Stowing away aboard the starship that transports the team to the distant planet on which the first rounds of racing take place. And it turns out to be a good thing she did, because the team's pilot, Rick Thunderbolt, becomes injured during the first race when their racer explodes. Now Molly must take over as pilot for the Earth team, much to the dismay of Don Wei, who apparently feels that women have absolutely no place in racing. All is not smooth-sailing from here on out, however. Not only does the Earth team does not win every race, but even for the ones they do win, they don't necessarily come through unscathed. But pulling out of the race is not an option, as the fate of the entire world, and possibly the entire galaxy, depends on the Earth team coming through to the very end. Friends and enemies, pitfalls and perils, mystery and loyalty, they all play a part in this action-packed series. The art style is quite unique (such as how none of the characters have noses drawn on them), but it works extremely well. The aliens are all interestingly designed, and even the specific individuals of the various races have uniqueness, so they're not just one design that's cloned over and over. The character designs, mech designs, and even backgrounds all have great attention to detail, which goes far into helping the audience feels as though we are in a real universe. The two-volume DVD release contains all twenty-six episodes, uncut. Since I hadn't seen the show on television, I cannot tell you how the uncut episodes differ from those that were broadcast. But it shouldn't really matter, as either way you'll most definitely want to pick up this series on DVD. There are also some extras features on board. Each volume contains a making-of featurette, star-racer profiles, and original concept art. Volume one gives you a sneek peek at volume two, while volume two gives you the original MIPCOM presentation (MIPCOM is a trade show) and a complete opening title sequence. I wouldn't hesitate to recommend this to anyone and everyone!